This post gives advice on clothes and shoe shopping in Bogota – you might find it useful to read my post on what to wear in Bogota first! if you’re looking for souvenirs, gifts or flea market type shopping, my post on markets in Bogota may be useful. If you’re looking for books, the Librería Nacional and Panamericana are chain stores which you’ll find throughout the city. There are some excellent second-hand bookstores in the center around carrera 8-8a and calle 15-16. 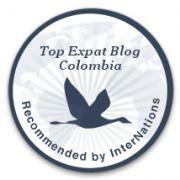 My favourite one is the Merlin bookstore, and Colombia.co has also put together a list of other recommended bookstores. Bogota has many shopping malls throughout the city, and some boast familiar global high-street brands such as Forever 21, Zara, Mango, Bershka, NAF NAF and Esprit. If you’re shopping in Bogota you will probably find that the prices are similar or higher than back home, and they’re actually a bit on the expensive side if you’re earning in Colombian pesos. Falabella is Colombia’s main department store and sells clothes, make-up, electronics, furniture etc, and has concession stores including Accessorize, Warehouse London (but clearly just selling stock which they couldn’t shift in the UK! ), Desigual and Elle, among others. You can find Falabella in Santa Fe, Unicentro and Titan Plaza shopping malls, and there’s also one on calle 53 in Chapinero. Popular shopping malls include Titán Plaza (calle 80 with Boyacá), Calima (close to the Paloquemao market, in a bit of a dodgy area, so take care outside! ), Santa Fe (in the far north of the city), Hacienda Santa Barbara (in Usaquén, cra 7 with calle 116, and close to the lovely Usaquén market), Gran Estación (next to Salitre El Greco Transmilenio station) and Unicentro (Santa Barbara – cra 15 with calle 123) among others. Centro Mayor is south of the centre and is one of the newer shopping malls… and it’s huge! It has an especially large offering of stores selling sportswear. For luxury and high street brands, try the Andino, Atlantis and Retiro shopping malls in the Zona T/Zona Rosa. You’ll find Louis Vuitton, Dolce & Gabbana and Coach, among others. We might as well clear this up now; Primark has not yet made it to Colombia (but H&M just arrived in 2016!! ), so it won’t be as easy to find the cheap high-street prices that you can find in Europe and the US. If you’re looking for cheaper clothes, you can try Exito supermarket’s brand, or venture along to San Victorino in the center near Avenida Jiménez TransMilenio station, where there are many low-cost ‘shops’, stalls and car-boot-sale type vendors selling all kinds of things. Just hold on to your bag tightly in this area (avoid wearing a backpack! ), and don’t walk down any quiet streets. It can get pretty dodgy – needless to say, NEVER go there after dark. San Andresito is a huge market area where you can find indoor markets selling anything and everything for lower prices than normal high street stores. Just be aware that a lot of the branded stuff will be fakes (but obviously they’ll tell you that they’re real!). Take the TransMilenio to Sans Façon station (around calle 13 with carrera 22) and walk a few blocks down carrera 22. Beware that if you’re a woman, you will probably receive unwanted attention in this part of the city. Carrera 13 between about street 45 and 65 in Chapinero is full of cheap shops and outlet stores, so it’s a good option if you’re on a budget, although not cheap if you end up getting your purse snatched so make sure you keep your valuables hidden and hold onto your bag tightly in this area! If you want reasonably priced shoes for all occasions, try Payless shoe store, which can be found in most shopping malls. I think Bershka‘s prices are also ok – their flagship store is in the Zona T. Andino Shopping mall also has a Steve Madden, and Falabella in Titán or Unicentro shopping mall has quite a large range of shoe brands. Velez and Bosi are pretty good for leather shoes and boots, but not particularly cheap. One of the comments below this post also recommends the area of El Restrepo for buying shoes, but I haven’t been there myself. There’s an ‘outlet triangle’ (if you check Google maps, that’s what it looks like!) between Avenida de las Américas, carrera 65 and calle 13. There are also some outlet stores on calle 17 and calle 19 between carreras 62 and 69B. Type ‘Outlet Bogota’ into Google maps and you’ll see where I mean. These are not the nicest areas of town, so if you plan to go shopping there, go by Uber or in a pre-booked taxi and don’t display any valuables (wallets, phones, cameras) while you’re walking around. I also recommend not taking a backpack as these are the pickpockets’ favorite! Just watch out for counterfeit clothing brands. Thanks – you’re right, and I’ve been planning to write about San Andresito for a while now. Will try to get round to it soon!